Product Showcase: The Spider's Web by My Mind's Eye + a Giveaway! When I first saw the peeks for The Spider's Web, a new Halloween line, from My Mind's Eye, I was instantly in love with its shabby, yet elegant quality. Then when I saw it, in all its beautiful glory, I could not wait to get my hands on it! I picked up the whole paper kit, which comes with one sheet of each double sided paper, and a sheet of die cuts. Fabulous value for a ton of paper. Both sides of each paper are very useable patterns. The die cut sheet also comes with 12" borders. The borders have wonderfully detailed cut edges. Being primarily a card maker, I had a blast making cards with these papers and die cuts. The die cuts are not only perfect for journaling on layouts, but make great layers for cards. Change the journaling tag on this card and you could have a great Thanksgiving card. The spider and its web are both die cuts. The orange border is also from the die cut sheet. I brought out its great edge with some brown ink. 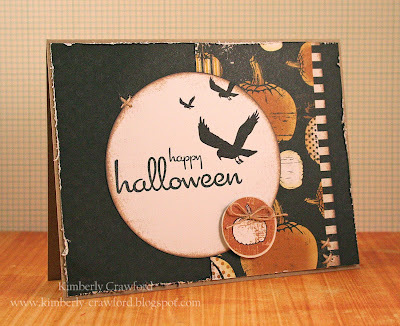 On this card, I stamped "happy halloween" on a journaling die cut. I was very happy with how well it took ink. Sometimes journaling spots have a finish on them that does not allow you to stamp, but these are the same great quality as the paper. Now making Halloween cards is fun, but this line of paper gives you so much more. So many of the papers have beautiful and not necessarily spooky patterns. For this card, I used a brocade pattern paired with a plaid border. I love the fall feel of this line. - The patterns are scaled for ease of use by both scrapbookers and card makers. This also would include the die cuts. - Nice, quality paper, with a good weight. - Great value, as you can use the papers for more than just Halloween. - The only thing would be that I would like more of the borders. What projects do you see yourself using these papers with? Do you think you will use them for something other than Halloween projects? Have you already picked up these papers? Leave a comment before Noon EST tomorrow (Saturday) to be entered to win a prize pack from My Mind's Eye!! This is the first time I have seen these papers and I have to say that I am in love with them! You have made the most spectacular cards with them. I am itching to make some home decor projects and layouts with this line. Thanks for the review! Haven't seen these around here yet...I've got great Halloween pics of my boys that need to be scrapped. This paper looks awesome! What a beautiful line of papers! I love the cards you did with them; elegant, yet totally fitting for Halloween. I would love using these on the treat bags and boxes i make by the dozen for halloween. GORGEOUS cards kim! great review--i love these papers! Wow! These papers are delightful and eerie at the same time :) Love it!!! Beautiful cards too!!! I love this line!!! I can't believe that you left a picture of the ribbon out of your review. That little mummy is one of my favorite parts! ohhh, i love these!! I hadn't seen these yet and I love the vintage look of them! Awesome review.Thanks! These are really quite nice papers for Halloween! I usually don't buy a lot of Halloween papers because I don't have many photos, if any, from the holiday, but I like to get a few for cards and fun stuff. I like that these aren't kid-oriented so much! Wow, I haven't seen this paper but I love it! There are several pieces that I need that I can use on other occasions besides halloween. These are beautiful projects!!! LOVE seeing them, thanks for sharing! The papers look great!! this is the first time I'm seeing them. I'd love to make an acrylic album with this set of papers! I love My Minds Eye and this collection doesn't disappoint. I would love to have it just to look at it. I'd most likely use it to scrapbook Halloween but loved the friend card! Oh, love it!!! Finally get to see it, I keep hearing how awesome it is!!!!! TFS!!! Gorgeous cards!!! I would love to make a Halloween garland or wall hanging with these papers- so fun. Your hand-cut pumpkin is really beautiful- thanks for sharing! spooky! I would love to find the time to do a halloween party this year and make cute deco! When my Granddaughter was little my daughter taught her that "I want that!" was not a doable comment. Soo...She would say to me Grandma I NEED that! Well...I NEED THAT! I can see why you liked this line.. I love all the papers! And I really love the cards you made with them! I like that the colors aren't black black and orange orange, but muted tones. I totally didn't answer your questions. I haven't seen the papers before. I want to make a Halloween book and these would be perfect for it. Kimberly, you did an outstanding job creating with these papers! LOVE all your cards! I think this is a very elegant paper line I would most definitely use it for something other than Halloween. Gorgeous! OOOOOOh I love these. I hadn't seen these yet either but I love the shabby look of them. Not all bright orange and green like usual Halloween lines. Can't wait to get my hands on some of these. Wow, great papers!! Yes, many of them could be used for projects other than Halloween. I would love to win them! Love the assortment of papers and accessories. I also primarily make cards. I would definately find a use for these! Great kit - love all the cards! Thanks for the great giveaway. Such wonderful projects!!! I love this paper line, so so cute!!! I have not seen these but OH MY ~~~I lovey them so much. I must must must find these! Thanks for the great review Kim and your projects are GORGEOUS as always. I absolutely love this line...actually I love anything by MME. I am always inspired by their collections. I would make Halloween cards. Your cards are adorable. I saw this paper online but your cards really show it off! I'm a fan of MME, I love it all! WOW would i love this kit! you made gorgeous things! Oh heck yeah I can see myself using this!! =) And no, I think it has to be limited to Halloween stuff; that skully paper and those prints would be perfect for other things too! I love every one of your cards!! Would love to win the paper too. Your cards are fabulous!!!!!!!!!!!! I am a huge fan of MME and this year they have outdid themselves!!!! I have a mini album all planned out now....all I need is this line! I'm not a big Halloween girl, but I LOVE your friends card, and the non-spooky papers are GORGEOUS. Those papers are wonderful!! I can see using them for other things than just Halloween. Heritage, fall, or maybe just an everyday photo. Love the vintage look about them!! Your samples are wonderful!Thanks for sharing! Wow, great selection. I love creating Halloween projects and these new papers would be perfect. Thanks for the chance to win. I have not seen this line yet. I love it! And as always Kim, beautiful cards. I really like the colors and the graphics of these papers. I think I would make a cute banner that says Boo! or something for Halloween. I like this line. I could see the papers being used of course for any fall holiday or party card or invites. The skull and crossbones as well as some of the other papers would work great for pirate themed items as well. I just have to say that My Mind's Eye has knocked it out of the park with there new Halloween line. I just love this time of year. I have lots of of Halloween pictures to catch up on and some new home decor ideas that this line would work great for. i have a few of these papers on my buy list :) i'll use them for LOs since i don't do cards or other types of paper crafts. I would use these for any and all paper crafting! I LOVE MME and these papers are drool-worthy! I don't have these yet...but they are on my wish list! Wow, I luv the fact that these patterns can be used for other occasions and not just Halloween. Luv the fact that they are not bright colors...now I want them too! I LOVE My Mind's Eye - I just made something like 16 double page layouts with My Mind's Eye products - so I need to replenish my supplies! Pick Me! Pick Me! :) Katie. I have a black cat so i could do a black cat page. And i have two boys, so the skulls always come in handy! I haven't gone to any scrap stores since CHA, I am waiting until they start getting all the good stuff in. Love your cards! Thanks for the giveaway! A love Halloween and would surely make cards and a few layouts of the various holiday activities that go on around our town. The colors in the line are just lovely and the graphics are not too cute, just right! I need these papers! (no - not want, NEED). They are great for Halloween which I love, but I love their versatility too. Being a 'Halloween' type of gal (my birthday is the day before!) I think they just rock! Can't wait to get some of my own to play with! LOVE this line! Halloween is my most favorite holiday ever and I always have tons of pages to do. Definitely a must buy! Beautiful projects! I love that vintage feel too! That pumpkin on the first card is sooo cool! This is the first time I'm seeing this line and I really like it and would use it for other than Halloween for sure. I love Halloween and with 3 young kids I take a TON of pictures every year. I'm always looking for cute papers to use for their pages and I knew these were going to be must haves when I saw the previews! Great cards! I esp. like the last one - just goes to show that a great Halloween line doesn't have to be ALL Halloween-y! I could really use this. Thanks for the chance to win! MME is one of my favs, and these Halloween papers do not disappoint! And your beautiful projects really showcased them, Kimberly. Thanks for sharing and for the chance to win some great stuff! You just can't go wrong with MME and I'm loving their new Halloween lines. Can't wait to make some cards for my co workers! I so love and just got this kit from Two Peas! I can't wait to get crafting. I would use them to make a Halloween minialbum! They are too cute! That is the first Halloween paper I actually want! Thanks for sharing. I had not seen these anywhere before-- and I pay pretty close attention to what's new at 2Peas. I Love them! I scrapbook and make cards, and they do look really versatile. I actually like just about every paper pack MyMind's Eye comes up with, and this doesn't disappoint. Last year on a trip to Utah I stocked up and would have gotten this one too if it had been released! I just love Halloween paper. I would use them to make halloween decorations and even some spooky scrapbook pages. They would be great for a mini album too. Grandma would like to see the kids are dressed for trick or treating. What great papers! And right up my alley. I love the colors and patterns. I would use them in cardmaking. Several of them would be good for any fall cards, not just Halloween. I love the dimensional pumpkin! Gorgeous! I have not found these yet at my lss.... I hope they're on the way! Super paper! Fantastic cards! 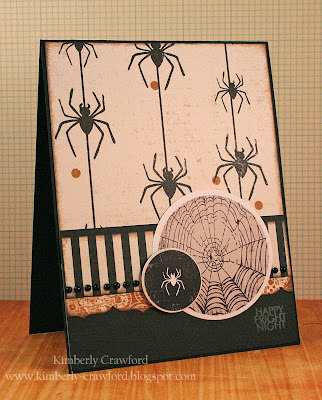 I just love the pumpkins and spiders for all sorts of fall fantasy cards and scrapbooking. I would love to win these great products. Beautiful line of papers! Love how well Kim's projects show the range of this collection! So very cute. I'd use them for both trick or treating as well as our annual trip to the pumpkin patch! I love MME! This Halloween paper rocks! I would love to have some to play with for some of my older pics! Thanks for the reviews and giveaway!! I am a Halloween freak...so I have already picked up this line of papers but I sure would like more to use for cards. Thank you for the opportunity! I have table in my front hallway that has glass on top of the wood. I like to put scrapbook papers under the glass for an easy-to-change "table runner." I had not seen this set before but I love MME! This is a great line!! Thanks for the review and beautiful examples with it. OMG, I totally love this line, I am a Halloween fanatic.I def. have to get me some of this.And the cards aaaadorable.Thanks for the ideas. Some of the prettiest Halloween papers i have ever seen! i love the elegant look. I would def use some of them for other things, like elegant cards and or scrapbook layouts! I have always been a My Minds Eye fan so can't wait to get my hands on these little goodies. Love your cards. Thanks for chance to win. I only ordered 2 of these papers and now wish I had ordered the set. Gorgeous work! Thank you for sharing this line, i hadnt seen it yet. Besides Halloween, I can totally see using some of the patterns for my boy pages, some vintage backgrounds and fall stuff. looks like a must have! What an adorable line! Never seen this in real life but I cant see so many altered projects and minis in this one.Love the texture of the paper and this could also be a good paper kit for family/heritage los.Thanks for the chance! I am not always a fan of the Halloween lines, but this is fabulous! I usually don't buy halloween papers, but your TSR reporters' project's did persuade me that my favourite company (My Mind's Eye) has the sweetest halloween papers possible! I love the vintage feel of this paper! Get for scrapbooking and cardmaking and projects for all ages. I will be getting these papers! And yes, I will do at least one non-halloween project with them, but mostly some halloween stuff will come out of them. However many of the papers are versatile enough that I can get a couple non-spooky things out of them! Thanks for sharing your great work-I LOVE these papers. I can see scrapping them, making cards, using some for home decor-the possibilities are endless and the cost unbelievable! I normally prefer to buy only the paper because I don't like all the extra's that come in a kit-no so with this line! with it also. I think it is also a great price. I don't like to purchase the paper packs that are $14.99 and higher too much paper for me. Those cards are beautiful! I love these MME kits and this one would be perfect for the Halloween banner I've been itching to make. These cards are absolutely wonderful. I hope I can find some of these papers! What a wonderful set!! I really love it! The colors are so cool. Not too bright but very rich-looking. These papers are great....and can i tell you how much I LOVE the layered pumpkin I never would have thought of layering up the ovals to get on....I am so going to case this and will give credit 2 u! Have an excellent weekend. These papers are beautiful! I love the way you used them for cards. I especially like the subdued colors, I think they will be fun to scrap with, as they will not overpower the photos. i am not that much into halloween, so i would use these papers for other kinds of paper projects. that brocade is stunning, and i love the simple elegance of the card you made. Usually do not go for Halloween papers, but I like the color of the papers and they have a vintage feel to them. Not so bright and gaudy like most Halloween papers. I would use it for making cards and maybe even try a scrapbook page. Have to dig out some pictures of my children in their Halloween costumes...they are all adults now! I am a halloween paper addict. I need that paper stat! Especially because I have lots of wicked crafting to do for the Sleepy Hollow faire coming up in my town! These are really great halloween papers. I live in Billings, MT and we don't see much of anything new around here. I am a paper-aholic and would love to win this kit. Thanks for the review and the opportunity. Your cards are gorgeous Kimberly! This collection looks awesome. I would love to make some Halloween layouts with this!! Oh My! I just looove those Halloween papers. I have to get them!I would use them to make beautiful cards! And some little Halloween craft projects for my niece and nephew. Thank you for the chance to win!! That would make my day!! Gorgeous cards, Kim! Wow Wow Wowwww!! Your details are always so pretty, and I love these MME papers! I don't make a lot of Halloween projects, but this collection is different, kind of classy and not "kiddy", I like it a lot! These papers are so pretty. Not so Halloweeny in the traditional sense, but unique. I love them. I will use them on Halloween layouts. Oh that looks fabulous! My LSS only had the OTHER one from MME, I like this one a little better, its a little more "darker" if you will, the other is very... Kid like. You knwo? I plan on spray painting some branches black and making a Halloween tree. These papers would be perfect for that! I love this line...love the colors! Your cards are darling! These papers would be perfect to create the treat bags for my boys classmates. I make the treat bags each year & they change depending on paper. Thanks fo the chance to win! Love this paper line! Gorgeous cards too! LUV it all ! 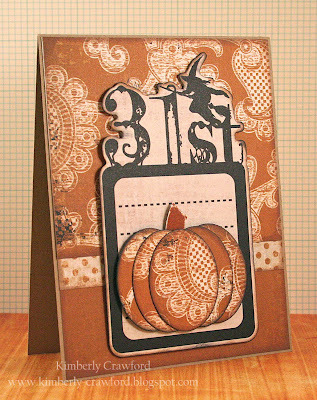 This is some great paper, I love a vintage look....I would make a Halloween banner with this kit....so fun! My Minds Eye really has some great stuff, and this new kit is definately no exception. Love it. Love what you did with the kit!!! Have to get my hands on some. Thanks for sharing your input.